Netherlands had a sweet revenge of the loss at South Africa 2010 world cup final as they humiliate world champions, Spain 5-1 in Salvador, Brazil. Spain’s worst defeat since a 1963 reverse to Scotland, this was more than a setback. This was a humiliating, humbling capitulation, a defeat that asks as much about the mental fortitude of Vicente del Bosque’s team as it does their hapless defending. Spain lived up to their favourites tag by opening the scoring through a Xabi Alonso penalty, but Robin van Persie equalised with an incredible diving header just before half-time and Arjen Robben put Netherlands in front with a cool finish. Stefan de Vrij forced in a third from Wesley Sneijder's free-kick, Van Persie dispossessed goalkeeper Iker Casillas to make it four and Robben's brilliant solo effort sealed the win. Costa was clattered early on by Ron Vlaar, and there were more heavy challenges as the first half progressed, but any idea that the Netherlands would turn this into an encounter as brutal as their defeat in Johannesburg four year's ago were soon dismissed. Indeed, it was Louis van Gaal's Dutch side who created the first clear chance when Robben slipped Wesley Sneijder clean through but captain Casillas's one-handed save kept the ball out. That miss appeared costly when Xavi released Costa into the penalty area and he fell under the challenge of De Vrij. Italian referee Nicola Rizzoli pointed to the spot, although replays showed Costa had stood on the Feyenoord defender's leg. 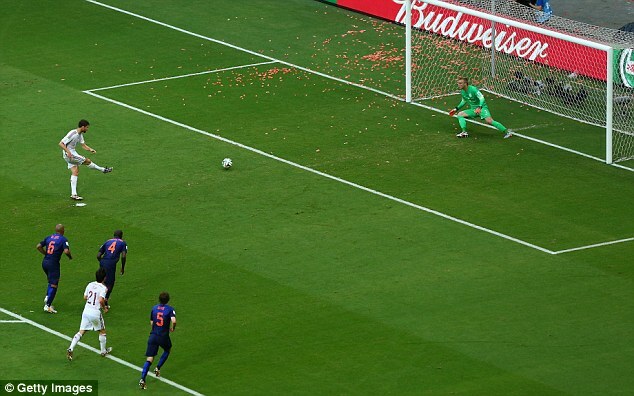 Alonso slotted the resulting penalty past Dutch keeper Jasper Cillessen but rather than leading to a period of dominance, Vincent del Bosque's men sat back and tried to defend their lead and Netherlands accepted the invitation to get forward and finally enjoyed some possession. However, it was Spain who came closest to scoring a second when Andres Iniesta played in David Silva with a glorious inch-perfect pass but the Manchester City midfielder's tame chipped effort was turned away by Cillessen. It was a missed opportunity that would come back to haunt Spain as within five minutes, Van Persie had scored the goal that proved the turning point of the match. The Manchester United striker escaped the attentions of Sergio Ramos and met Daley Blind's crossfield pass with an astonishing super man like 15-yard header that looped over a despairing Casillas. Netherlands left the field at the break embracing each other with wide smiles and they carried that momentum into the second half. Van Gaal's men deservedly took the lead when Xavi - the heartbeat of Spain's midfield for so long - lost possession and Blind supplied another pinpoint aerial pass from the left, which Robben expertly controlled before eluding Gerard Pique and finishing confidently. Spain were now rocking and Van Persie smashed a half volley against the bar before De Vrij bundled a third goal over the line after Casillas missed Sneijder's inswinging free-kick from the left. 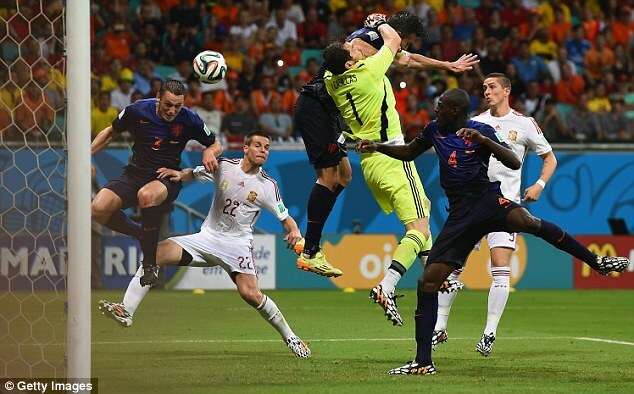 The goalkeeper protested that he had been impeded by Van Persie - and he had a point - but referee Rizzoli was unmoved and the Netherlands were suddenly in control at 3-1 up. Silva thought he had given the world champions hope when he scored from close-range but his effort was correctly ruled offside. 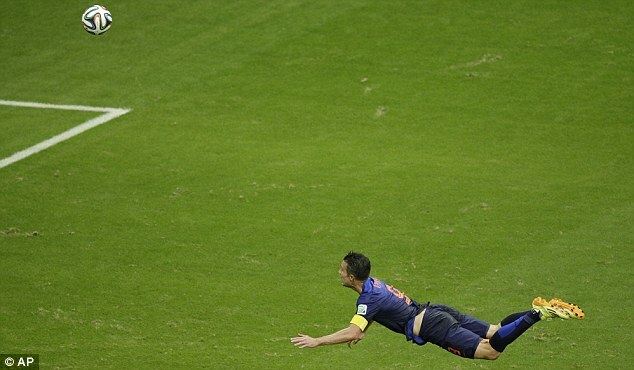 And moments later, Netherlands were 4-1 up. Casillas, who produced a stunning save to keep out a Van Persie volley, turned villain when he miscontrolled a backpass from Sergio Ramos and was tackled by Van Persie, who slid the ball into an empty net. Robben then capped a fine individual performance with a fine solo goal. The winger raced from inside his own half to latch on to Sneijder's through ball and outpaced Ramos before taking the ball round Casillas and smashing past two defenders on the line. Spain were in pieces and continued to be torn apart, substitute Jeremain Lens and Robben going close. And Spain's torrid evening was summed up when substitute Fernando Torres failed to score from three yards. The Chelsea striker looked certain to register a consolation, only for Blind to arrive with a timely last-ditch challenge. Spain were on their knees. In their eyes they had the shocked look of street mugging victims. Holland scored five and could have scored eight. Iker Casillas – who had a dreadful night – produced a stunning double save late on, while Wesley Sneijder fell over when it looked easier to score.